A concert series dedicated to classical music of smaller ensembles with modern flair. The title is taken from Robert Schumann’s breathtakingly beautiful “Frühlingsnacht” from Liederkreis, Op. 39. This ultimate German romantic work is programmed with equally gorgeous Gian Carlo Menotti’s “Cantilene & Scherzo” for harp, violin and string quartet and Debussy’s dynamic String Quartet, featuring the Esterhazy String Quartet and harpist Maria Duhova Trevor. Special Event | FREE ADMISSION! In collaboration with the MMAMTA (Mid-Missouri Area Music Teachers Association), Odyssey’s Kids@Heart will revisit Saint-Saëns’ much beloved Carnival of the Animals. Come an hour early at 2pm to experience Instrumental Petting Zoo, where you can try out some instruments being used in the concert. This is a FREE concert - bring along your friends, as many as you like! (This is a rescheduled event from January 2019.) Donations are gratefully accepted. A special presentation and production of the musical segment beginning with field/work songs all the way to the arranged spirituals of H. T. Burleigh, Margaret Bonds, and Moses Hogan to name a few. Curated by Dr. Maya C. Gibson, this concert features former Chanticleer member Marques Jerrell Ruff and special guest soloist, international Opera, Jazz and Gospel artist Jolie Rocke Brown, with MU's Assistant Director of Choral Activities, Dr. Brandon A. Boyd on the piano. This concert is sponsored by the Second Missionary Baptist Church. Donations are gratefully accepted. Rachmaninoff’s music is full of bells, which can be heard prominently in his two piano work, Suite No. 1, Op. 5, known as Fantasie-Tableuax. This program will also feature DRAX, and various percussion and saxophone ensembles in holiday tunes and more! February 15, 2019 (Fri) 7 pm, First Baptist Church in Columbia - Cancelled due to snow. “Baroque Concerto” will feature a pre-collegiate concerto competition winner with the Odyssey Chamber Ensemble, led by Jefferson City Symphony Orchestra conductor Patrick Clark. Because of his affiliation with his newly found Southside Philharmonic Orchestra based in Jefferson City, Odyssey has a partnership to produce one performance here in Columbia, and another in Jefferson City with the same classical concerto competition winner – for the second year. The highlight of the concert is the annual Bach Cantata with Bach Collegium Choir directed by R. Paul Crabb, performed with the Odyssey Chamber Ensemble. 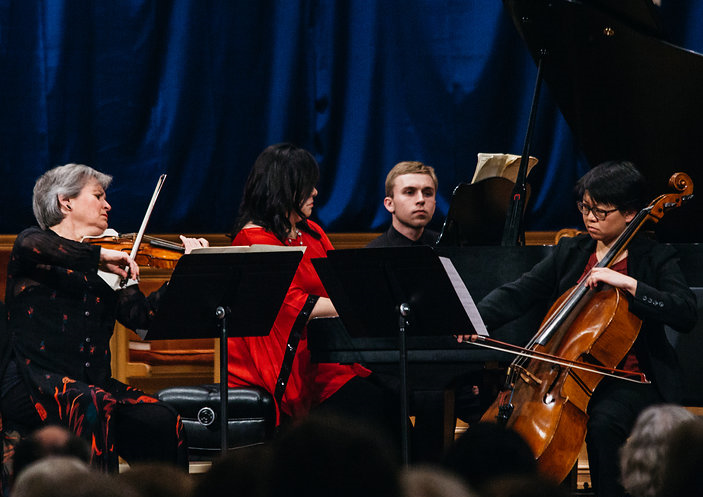 In collaboration with First Baptist Church, Missouri Symphony, Office of the President of the University of Missouri System, and the MU School of Music, Odyssey presents the 9th Plowman Chamber Music Competition & Festival. Recognized as one of the top five chamber competitions in the nation, Plowman has produced many award-winning, world class chamber ensembles since 2006, attracting many prominent guest artists as the judges. In March 2019, we welcome three such musicians: Dale Clevenger, horn; Ida Kavafian*, violin; and Wei-Yi Yang, piano. Full schedule is posted on the Plowman web site, www.PlowmanCompetition.org, as well as on Odyssey Program web page. *Note* The 2019 Plowman Finals & Award Ceremony is a University Concert Series presentation. Tickets are only available for purchase at the Missouri Theatre, or visit University Concert Series web site when the event comes closer. ​*Due to unforeseen circumstances, Ms. Kavafian is unable to attend. Instead, Lara St. John is performing a similar program with Dr. Miyamoto. Programs and artists may be subject to change without notice. ​Artists and programs are subject to change without notice. Are you on our mailing list? Look for Odyssey's annual brochure in your mailbox in late August; Tickets will be on sale online beginning September 1.